The US Senate has just unanimously approved a House of Representatives’ bill to begin the planning of a memorial for those who fought in Iraq and Afghanistan, exempting the effort from the Commemorative Works Act of 1986 which requires that the official creation of national memorials for conflicts must wait ten years after the war’s official end. Although the specifics of the siting were not prescribed, it is likely that the memorial will be placed in the Mall in Washington D.C. where the World War II, Korea War and Vietnam War memorials reside. Given that there is no end visible to the conflict the George W. Bush administration called the Global War on Terror (GWOT) that it began in response to the 9/11 attacks it is understandable why there was no opposition to the proposal. Once the design planning actually begins, however, there will likely be plenty of opposition. War memorials are ways in which nations define the conflict for posterity and thus are intensely political in presence and purpose. Usually, the war’s sacrifices are shown as necessary and heroic and the nation’s participation as glorious and victorious, but not always. The World War II Memorial, the most recently completed on the Mall, is Roman like in stature, with two triumphal arches, one for the European Theater and the other for the Pacific, 56 granite pillars commemorating the participation of the nation’s states and territories, a listing of battles, a fountain and a pool, and a wall of 4048 gold stars, one for each hundred of the war’s fallen. The memorial’s grandiosity though has its critics including those who think its placement astride the Mall between the Washington and Lincoln Memorials is too prominent and its design smacks too much of the fascism it commemorates defeating. The designs of the Korean and Vietnam memorials were much more controversial. The Korean War’s main expression on the Mall is uncertainty defined by the larger than life statutes of 19 poncho clad members of a combat patrol stepping warily through harsh terrain. There is no victory depicted here, just potential danger. 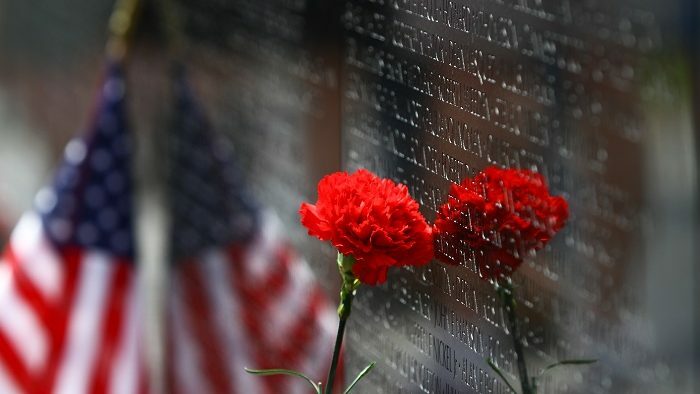 Even darker is the Vietnam War Memorial which is a long, sunken, black gabbro wall with over 58,000 names of the dead and missing of the war carved into it. So abstract and gloomy was the wall –one Senator, himself a veteran of the war, called it nihilistic–that statues of combat soldiers were added nearby. But they too had to depict the human burden of the war with a distant, exhausted look to their stance. Politics required also that the race and ethnicity of the soldiers be stereotypically clear, one depicted as white, another as black and the third as Hispanic. Another statute of female medical personnel treating a wounded soldier was later placed nearby to honor the contribution of female service personnel apparently somehow ignored in the other elements of the memorial. How will the GWOT be memorized? What will the war even be called in the memorial? GWOT is a Bush administration term for the struggle. The Obama administration sought first to call the war the Long War, presumably to highlight the legacy it was being handed, and then nothing at all as the war dragged on under what obviously was the Obama administration’s own direction. Many want to call it the War against radical Islam, demanding that there be recognition of the key identity the attackers claim to represent, but others fear the implications of identifying even a part of a religion as an enemy, especially a religion global in scope and with more than a billion and a half adherents. It is a war without a name and an end. When did it begin and what is its scope? US forces were attacked by terrorists in Lebanon in 1983 and in Saudi Arabia in 1996. Some observers trace the war to the 1980 Carter Doctrine when the US pledged to protect the flow of oil through the Persian Gulf. Oil now fades in importance, but the scope of the conflict continues to expand. The US is currently bombing in coalitions or alone in seven countries ranging from Libya in North Africa to Pakistan in Southwest Asia. There is even talk now of US forces bombing the Al-Qaeda offshoot in the Philippines, adding an eight country to the list. Will there be any nationalism expressed in the memorial? Will the defeat of Saddam and his Republican Guard and the successful hunt for Osama bin Laden be portrayed as triumphal victories or just combat actions in an endless series of attacks and counter attacks? Is it to be all dark – another long list of names for American lives lost? Some will oppose deeply any failure to honor in stone the bravery of those who fought rather than just their sacrifice. Others will want to put on display the world they seek in which there is religious tolerance and justice for all prevails. Will the horrors of beheadings and the random terror of an IED and suicide attacks be somehow shown or will it all be avoided so as suppress the parallel emotions generated by drone attacks and night raids? The battle to define the war’s meaning, price and prominence in American history while it is still being fought will be a very difficult one.